Enjoying Autumn / Fall in the Northern Hemisphere! Autumn is one of my favourite seasons as I absolutely adore mushrooms of all types; oyster, ceps, truffles, portabello, enoki, chanterelle, swiss browns and more. I’m currently in Toulouse, where they sell at least 5 types of mushrooms in the supermarket. What a joy! I don’t know if it’s because mushrooms are in season or if it’s always like that, but I’m glad to have so much choice. Mushrooms are incredibly versatile and can be thrown into almost any dish, from omelettes to lasagne. I love large flat ones roasted whole so the cap gets all juicy or small button ones crumbed and dipped into garlicky aoili dusted with paprika. 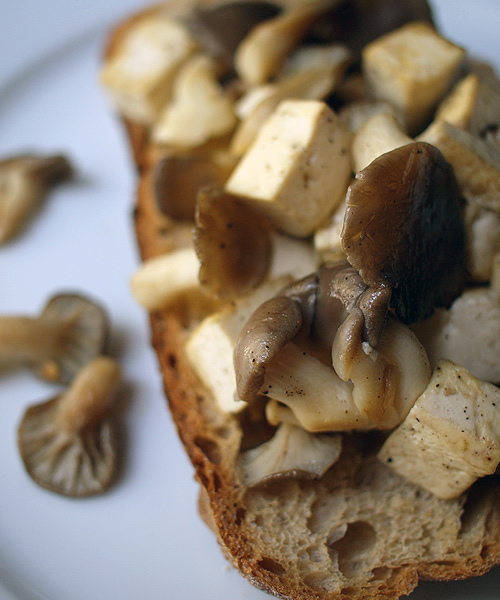 This time I’ve sauteed some shimeji and oyster mushrooms with firm tofu and served on rustic, lightly-toasted bread. It’s perfect as a vegan breakfast or light lunch. It’s also very good served with coconut rice. Mushrooms aren’t the only great thing about Autumn. There’s also pumpkins, fresh pistachio nuts, pears, celeriac, fennel and parsnip. All of which can be made into thick, delicious soups. Not to mention the pretty gold, orange and brown leaves and blue skies when there’s a nip in the air. I do love the fact I’m going to go straight from Northern Hemisphere Autumn into a full blown Aussie Summer in December though. Bring on the mangoes, berries, lychees and pineapples! 1. Pat the block of tofu with paper towels until very dry. If you’ve got time, put it on a plate wrapped in paper towels, top with another plate and weight it down with a few cans from your pantry. The reason for all this madness is to make sure the tofu is really dry so it crisps up nicely. 2. Once dry, cut the tofu into 1-2cm cubes and toss with the salt and pepper until evenly coated. Set aside. 3. Heat the vegetable oil in a frying pan or wok until very hot. Add the garlic and chilli and stir-fry for 1 minute until the garlic is fragrant. Add the tofu and brown the cubes on all sides, about 3 mins. Remove with a slotted spoon to a plate. 4. 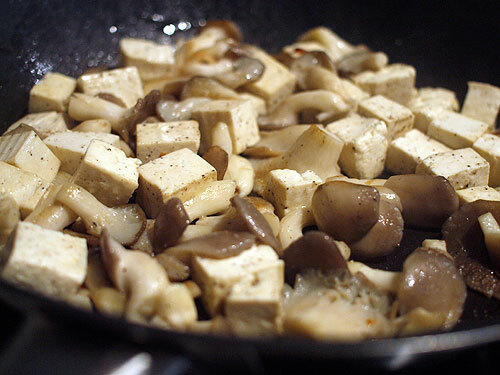 Toss in the mushrooms and saute until tender, 3-4 mins, then add the tofu back to the pan and drizzle with the sesame oil. Cook until the tofu is heated through and serve with toast if you like. ← Birthday wishes from John Torode! I have never thought of tofu for breakfast! And the mushrooms look amazing! Mushrooms are the best!! Thanks for this recipe, I’ve had some really nice salt and pepper tofu, would love to try and make it. Five types of mushroom – how absolutely sensational. And I do like your salt and pepper tofu idea – looks quick and easy. The early mangoes are already in the shops over here and they’re tasting great. By December the season should be in full swing! Mushrooms and tofu have never looked this great….a perfect start to a day!!! I think mushrooms are in season in the northern hemisphere – traditionally an autumn thing. Great recipe! What a perfect recipe! I am going to try it with my son!